"Ad Age would now have a vested interest in promoting Ad/PR/Marketing bloggers. The publication could now use these bloggers as sources for articles, or even interview some of them. ...But now 4 months later, the only thing that I can see that Ad Age has done to leverage the Power 150, is to create a nifty 'badge' that any member of the Power 150 can add to their blog. And yes, this badge links back to Ad Age's site." Fast forward 6 months later and I find myself in a round table meeting at the Advertising Age office in NYC. I wasn't alone. Respected industry voices such as Rohit Bhargava, Matt Dickman, Ann Handley, Geoff Livingston and others were there as well. And at the head of the table, sat Jonah Bloom—Ad Age's editor for all things digital. I won't go into the conversation as you can read about it here, but I wanted to point our some other items of interest. In addition to the round table, many of us were recently sourced for a story about having a "Chief Blogger", this was in response to the news of Kodak appointing one. 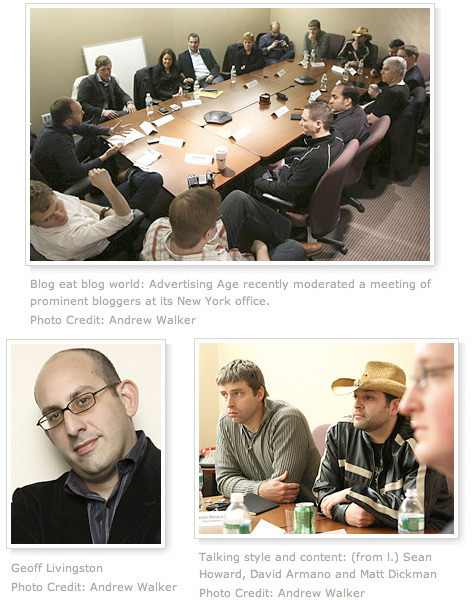 If you read that article, you will notice that Ad Age is using pictures that they took from that round table session. And one last thing. I am participating in a new group blog on Ad Age titled "Digital Next". I join other industry voices such as Troy Young, Colleen DeCourcy and Ian Schafer. And this brings me to what I think is the real story here. I was really tempted to title this post, "Ad Age Engages New Voices" as I don't think this is about bloggers as much as I think it's about broadening the editorial net to include alternative sources of information. Right now, traditional media is facing intense competition for people's time and attention. Why? Even the highest level CEO, CMO or executive knows how to use their favorite search engine to find relevant content on the Web. This means that in addition to the industry publications they trust, it's likely that they will come across very relevant content that isn't produced by the "professionals". In the long tail—what gets the most traffic comes up higher in the search engines. While much of the content produced by the "non professionals" isn't high quality—some of it is, and search engine rankings confirm that opening the gates to niche information and additional perspectives. So I'm validating the new Advertising Age strategy to engage "bloggers" through this post itself. They knew I would write it—they knew I would link to them. But that's not why they are doing this (though I think it's a positive perk). My guess is that Ad Age has come to realize that the practitioners in this space—the active participants who are speaking from actual experience vs. theory have something of value to bring to the table. And they may just be coming to terms that their audience is ready to hear some new voices. At least that's my opinion. But that's why you come here right?